Digital Making: What Have We Been Up To? Ideation and Product Development This entire semester, our class has been learning a great deal about the process of making and what it means to take an idea from early beginning thoughts to full execution. We had the privilege of learning about the Maker Movement from Prof. Kylie Peppler who teaches at Indiana University. We've learned about the inherent value of thinking like a 'maker' and learning about the different ways that we can take a problem and transform into a tangible solution that can benefit others. Additionally, we've discuss the ideation process and learned how to approach the sequence of steps that it takes to actually develop a product. Design for America put on a workshop for us that helped us to see the different stages of innovation and how to ultimately get to your final product using principles like human-centered design. 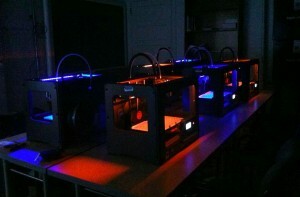 Digital Making focuses on creating and making digitally through the medium of 3D printing. We have learned about a variety of different softwares that we can use to develop 3D models that can ultimately be printed at the Illinois MakerLab on MakerBot printers. The first platform we learned about was Tinkercad. This web-based tool allows users to easily create a model by providing pre-created geometries and basic tools to do things like create holes, construct letters and numbers, and modify the size/shape of the objects users work with. We then progressed to learn about Autodesk Fusion 360. This software is more sophisticated and allows for users to manipulate objects on many more measurements than a platform like Tinkercad and with greater amounts of precision. We also learned about a high-end software called Geomagic which essentially renders 3D scans, refines the scans with various tools, and parameterizes scans into models to ultimately be used in softwares like Fusion 360 or Autodesk Inventor. Gaining exposure to all of these different tools has been invaluable. In addition to learning about all the different methods and tools for #digitalmaking (also our class hashtag! ), we took time to understand the implications that digital making has had and is continuing to have on today's dynamic business environment. 3D printing is becoming the disruptive technology of the future that has great implications for production processes, procurement, supply chains, and much more. Additive manufacturing, a corporate extension of 3D printing processes, is helping to lower product lead times and helping to optimize product manufacturing by lower costs and enabling customization. One of the first things you learn in this class is that complexity is not an obstacle when it comes to 3D printing and many digital making methods. This enables the production of objects with complex geometries that may have not been possibly on a larger scale before. In addition to 3D printing and scanning methods, our class has learned many different techniques to make digitally. We've learned about arduinos and the use of e-textiles to create some very interesting things that require the use of circuitry and computer programming. Additionally, our class has been visiting the Champaign Fab Lab to learn and play around with other technologies. We've furthered our knowledge of how to use arduinos at the lab and we have also been playing around with digital embroidery and laser cutting technologies. Participating in sessions at the Fab Lab has enabled us to become makers with a myriad of new tools. As the course continues, we will continue to learn about technologies that are disrupting different making spaces and become more skilled in using these technologies. Stay up to date with the reflections from students on our class blog at http://publish.illinois.edu/digitalmaking/ or follow our hasgtag #DigitalMaking on twitter. Newer PostSouvenirs for Women In Engineering - 3D Printed! Older PostMaking Things Class Nears Home Stretch!